Posted October 24, 2018 by Will Best & filed under PAT Test Labels. PAT testing is one of the most effective ways to fulfil your health and safety responsibilities as an employer by regularly checking that all the equipment operated on your premises is safe to use. By affixing ‘PAT Test Passed’ labels to each item when it is inspected, you reassure your staff and visitors that their welfare is at the forefront of your mind. 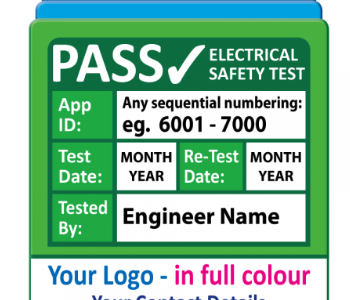 Where can you get PAT test pass labels? From PAT Labels Online, of course! PAT test stickers are an essential part of making sure this system works in everyone’s interest. Regularly inspecting each appliance – usually once per year or more – means that if a fault develops it is usually spotted before anyone comes to harm. But ‘Passed PAT Test’ labels are not the only documentation involved in this system. The inspector may sometimes be required to use ‘Failed PAT Test’ labels when a product is not up to scratch, or even a Failed PAT Test tag which physically prevents the appliance from being used until it has been repaired. There are many types of PAT test tags for use under various circumstances. Cable wrap PAT testing labels can be attached to items which have no suitable surface for a sticker or regular label. And PAT testing tuff tags are resilient enough to do their job of displaying important safety information under the harshest of conditions. Some companies, and even some professional electricians, struggle on with standard PAT testing stickers, labels which may not be ideal for all applications. But it’s now possible to order just the right PAT test labels online, including the tuff tag PAT labels and cable wrap PAT test labels mentioned above, from PAT Labels Online. PAT Testing Visual Inspection Labels – When PAT testing appliances, the first part of the process is usually a visual check, and devices which pass this stage can be affixed with our Visual Inspection PAT Labels. Personalised PAT Testing Labels – Are you an electrician who provides a PAT testing service to various companies? Or are you responsible for performing your company’s PAT testing in-house? Either way, you may like to have your company details displayed on personalised PAT stickers to record who conducted each inspection. See our website for details of our personalised label service, including what information can be displayed on each personalised PAT test label. Barcode PAT Testing Labels – These are the PAT test labels UK companies often find most useful. Barcodes can contain a wealth of information, and in the case of PAT stickers they can become a combination of asset ID tag and PAT test label. Your computer system can record results and even raise a reminder when a new inspection is required. Custom PAT Test Labels – If you can think of any other information which you would like included on a PAT label, get in touch and we’ll see what we can do.